San Diego State football team was fired up after its star rusher Rashaad Penny’s eye was gouged by a Northern Illinois player to beat the Huskies 34-28 Saturday at SDCCU Stadium. There was some trash talk from the opposing team in the tunnel before the game started, Aztec cornerback Kameron Kelly said, but things got personal when Penny’s right eye was intentionally poked in the eye with 4:12 left in the first quarter, a move that was captured by TV cameras but was not caught by the referees. “It got us fired up. I told the defense … (if) that’s their attitude, we got to have that same attitude between the whistles and start making them feel it between the whistles,” Kelly said. Penny went into the locker room to get some eye drops and returned to the game with a protective visor on his helmet. With the win, the No. 19 Aztecs are 5-0 for the first time since 1975 when they were 8-0. The game started off with a quick scoring run by Juwan Washington. Washingon raced through tacklers for a 96-yard kickoff return touchdown to give SDSU a 7-0 early lead. The Huskies quickly responded with a 7-play, 73-yard scoring drive that culminated in a 34-yard scoring pass from quarterback Daniel Santacaterina to wide receiver Christian Blake. 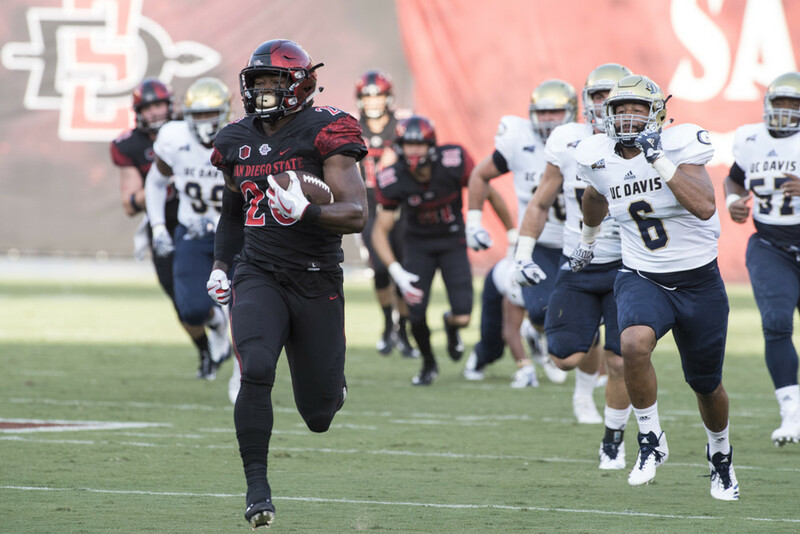 The Aztecs whiffed on their next possession and were forced to punt, but a fumble by the Huskies that was recovered by Andrew Aleki gave SDSU another chance to score. Aztec quarterback Christian Chapman quickly capitalized on that with a perfect pass to Penny for a touchdown. The Huskies answered back with a long scoring drive to tie the game 14-14. Penny returned the ensuing kickoff 19 yards to San Diego State’s 26-yard line and that was when the eye-gouging incident happened. As Penny lay at the bottom of the pile, instant replays showed Antonio Jones-Davis intentionally reached into Penny’s facemask and poked him. When asked about the incident NIU’s coach Rod Carey said Jones-Davis admitted the incident to him. After Penny’s eye-gouging incident, the Aztecs had 17 unanswered points in the second quarter, the Huskies, however, quick to answer back in the third quarter with 14 unanswered points to close the gap 31-28. John Baron’s 21-yard field goal in the fourth quarter coupled with Kelly’s two interceptions preserved the win for the Aztecs.